I love fashion. I also love London. I'm still trying to decide which I love more and if such a decision is even possible. Because of these loves, my ears perked up at the name Mrs. Ebury--a very, very minor character in Virginia Woolf's Between the Acts. Mrs. Ebury, mentioned only once, "had forbidden Fanny to act because of the nettle-rash" and with that, had completed her role as concerned townsperson. She might be completely forgettable, except for her name...Ebury. I'd heard that name somewhere before. Ebury Street is the name of a street in London. But more importantly, Anya Hindmarch, one of my favorite British designers, had named a handbag after the street. I think that the handbag reference is what made the name stick. It really is a great bag, sturdy and classic, there's even a "bespoke" version that can be made in the buyer's (or recipient's) choice of leathers and then inscribed with a note, in the buyer's handwriting, above where the inside lining begins. I dream of having one of these bags given to me. But I digress. The bag was named after a street and I wondered what significance the name might have for Woolf. Several of Woolf's characters, particularly in Mrs. Dalloway, seem to have names that are anything but random. Septimus Smith--a common surname, combined with a first name that bears the weight of the world. Septimus is every young man in England that was lost or damaged by World War I. Clarissa's last name, Dalloway, is perhaps a play on "dally"--she takes her time with everything, dallying in flower shops as well as her past. So, I figured I'd have a look around and see if Ebury Street could mean something special for Virginia Woolf. And it looks like it just might. 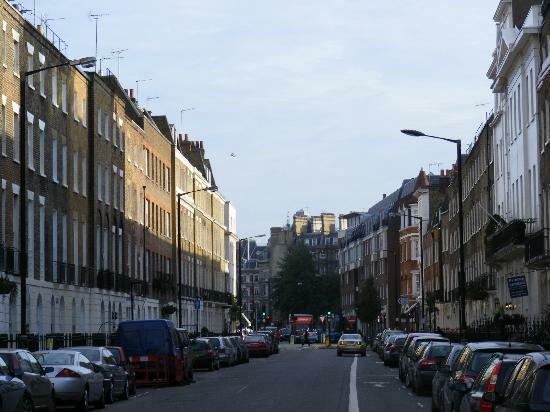 First of all, Ebury Street is located in Westminster, London. Nothing particularly special there, except that Clarissa Dalloway lived in Westminster. Perhaps Woolf, by using Mrs. Ebury as the character who takes Fanny out of the show because of nettle-rash, is making a comment on the upper-class Londoners who inhabit Westminster--maybe they're too cautious, unfair, or just not very much fun. I think that might be stretching it a little. Of more interest to Woolf, I think, is the person in her life who lived on Ebury Street: Vita Sackville-West. Sure, Mozart lived on Ebury Street for a few months when he was writing his first symphony. Alfred Tennyson, a poet laureate who ran in Woolf's parents' social circle, also lived on Ebury Street--apparently spending much of his time there smoking shag tobacco and drinking port as well as writing Maud. However, it's no secret that Vita Sackville-West held a special place in Woolf's heart--their love affair lasted from sometime in the early 1920s until Woolf's death in 1941. I'm fairly confident that Mrs. Ebury was named after the street that Sackville-West (and her husband, Harold Nicolson) called home and a place that Woolf certainly visited more than once. 1. There's something there--it seems impossible that Woolf would name a character after the street her lover lived on purely by coicidence. 2. I want the Ebury bag...my birthday's right around the corner..I'm just sayin'.